OMG, I'm counting down the days! Monday next week I will be back in one of my fav places in the world; Mykonos! You might remember that I visited Mykonos last year as well, I had to get back to my dream island, because I fell in love! However, first I have to study for another week! I have two exams upcoming week, so fingers crossed! What are your plans for your Summer holiday? As you may know, I'm a serious iPhone case addict. That's why one of my close friends gave me this fab new Chanel perfume case! Besides this, I have a huge addiction for Moschino case (remember my duck and french fries case?). However, when my friend informed me about the new eatable iPhone case from Moschino I couldn't resist.. A ice-cream iPone case! OMG! Did you already check it out? What's your favorite iPhone case let me know! Hi guys! Did you all survive your weekend? 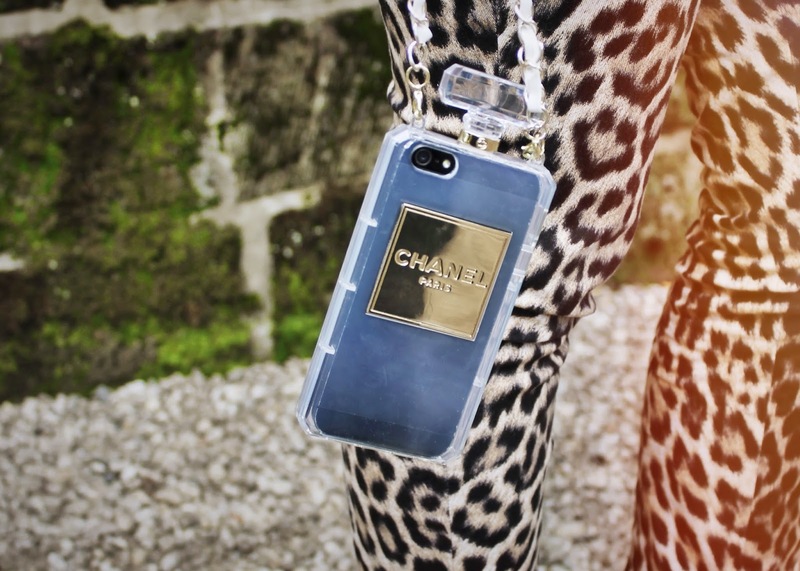 I really want to share my new iPhone case candy with you! I got this Chanel perfume case from a couple of close friends and I'm in love! What do you think of my new fab case? Let me know! Have you already checked out my PHOTO BLOG on FindMyMusthave.nl? Go to the website to check out loads of outfit shots, beauty, new must haves and much more! CHICKS WITH KICKS! So happy with my new Nike x Liberty printed sneakers. What do you think? OMG guys, did you notice what bag I'm carrying around? It's the Valentino Vavavoom bag! Too bad it's not mine though, however, it is from my fashionable mom! She was considering to buy this bag for ages, however, I finally convinced her that this is THE bag that suits her so well. Thus she went out buying this bag with her best friend when she was in London. I couldn't wait to go back to my parents' house to check out her new baby! And of course she could expect this question from me..: "Mom, when can we shoot this bag for TTOF?". Of course she expected that question, so we went out to shoot this outfit. It is really special that I could borrow her bag for this shoot, because when my mom buys a new bag, it is usually in the package for a couple of months. She considers it as 'being careful with your stuff'. From my point of view it is such wast to leave it wrapped up for so long! That's why I took the first step, to wear it for just these photos. Maybe it will motivate her to carry this bag around as soon as possible ;-). What do you do when you buy something new? Wear it directly as I would, or leave it wrapped up for a couple of months like my mom? Please share! Hi guys, it's Wednesday so we're halfway! Keep the spirit alive I would say ;-). I gladly want to present my new Lovers & Drifters Club vest. You may have noticed that I'm a huuuuge fan of this brand (which former name was Lovestoned Clothing). After receiving my salary for the month, I figured out to spend it wisely on this vest which I had my eye on since a couple of months! So what do you think? Let me know! Make sure you take a look at the website here, it's totally worth it! Hi guys! I admit, I'm far from a beauty queen or addict. However, I still have my personal favorites! Lipsticks don't really suit my lips well (or I didn't find the perfect color yet), however, lipgloss is a must! Though, I always struggle with lip glosses that are waaaaaaay to sticky, so when you're riding your bike or whatsoever, your hair sticks on your lips (happens to me all the time). So when my rookie gave me this one for Christmas, I fell in love. Truly, this is the best lipgloss ever! So considering buying a new lipgloss, make sure you check out this one. And it's affordable too! Hi guys! How cool is my new sweat from Wildfox? Yes, indeed, at the moment in a period of exams etcetera I want to live on an island with a cocktail next to me, wearing a cool bikini and have sand between my toes. My favorite island of all is Mykonos. I was there last Summer and had the time of my life. That's why we decided to go again this year. I cannot wait! What is your favorite island? Hi guys! Enjoying your sunny Sunday too the max? I'm completing my relatively basic look (for me) with this fab new bag I got from the web shop I Want That Musthave! I Want That Musthave recently launched their 2.0 version full of new must haves you should have in your wardrobe like this eye catchy bag! Make sure you check out their cool items on their website here! What is your favorite must have? Let me know! PS What do you think of my new leather jacket I've bought yesterday from Whistles? I'm in love!